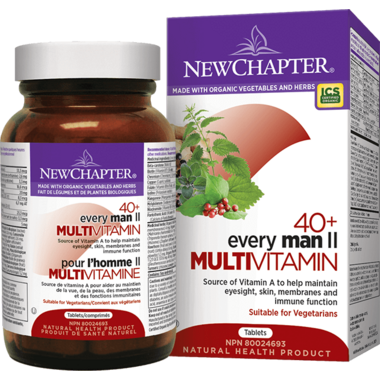 New Chapter Every Man II 40+ Vitamin & Mineral Supplement is non-GMO and organic. This supplement is an antioxidant for the maintenance of good health, helps to maintain immune function. Recommended Dose: Adults- Three tablets once per day with food. Take a few hours before or after taking other medications. Cautions and warnings: Caution should be used in individuals having known allergies to plants. Consult a healthcare practitioner prior to use if suffering from any diseases or taking any medication. Do not use this product if you have an allergy to any ingredient. Discontinue use and contact a healthcare practitioner if you experience an allergic reaction. Contraindications: Do not use if you have high blood pressure. Intake of Maca root is not recommended if you have a history of endometrial cancer. Fantastic Multi by New Chapter! The quality of the ingredients is fantastic and especially formulated for the needs of an older man. I love this product.